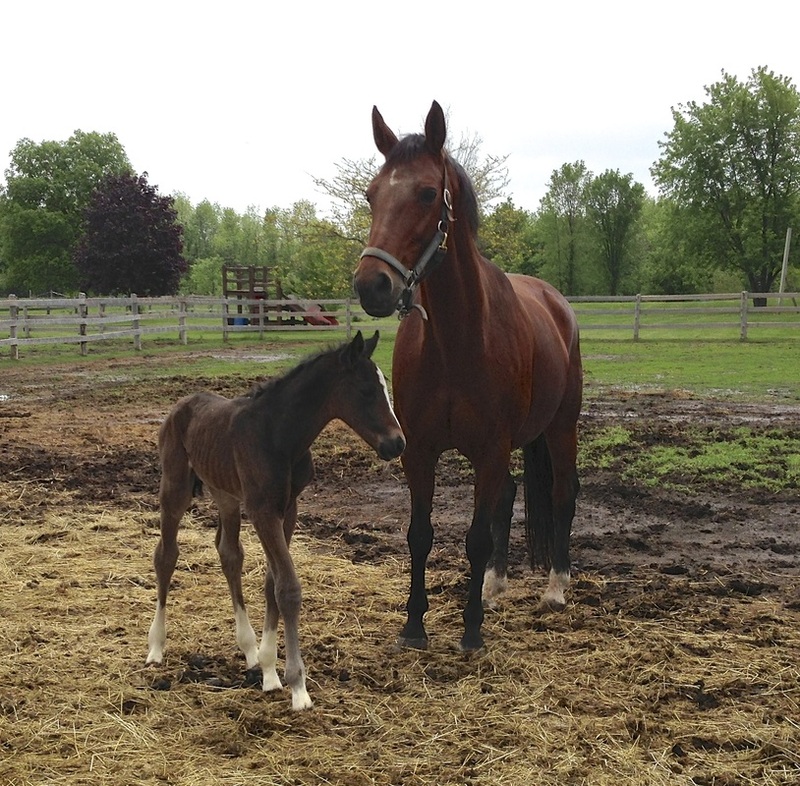 Ruby's second foal, Fyodora, a.k.a. Fia, was born on May 22nd 2013. She is a beautiful, big-boned dark bay filly with the perfect chrome! She is by FOUNDATION, an Elite Hanoverian stallion by Fidertanz/De Vito/Andiamo, out of REGALA by Regazzoni/Ehrentusch/Admiral. Awarded Premium Status at her Oldenburg Verband Inspection! On the occasion of the Oldenburg Stallion Days 2012 in Vechta he set a milestone: After evaluation of the performance record to date and his first foal crop, Foundation was the dominant I-a main premium winner of stallions with emphasis on dressage in 2012. Numerous foals from the first crop were sold for top prices at foal auctions in Vechta and Verden. Foundation features a certain charisma combined with an enormous ground-covering mechanic of movements with engaged hindquarters stepping under the center of gravity, a wonderfully uphill canter and a fantastic character. He finished his 30-day test in Schlieckau with dream scores: twice 10.0 for trot and canter in the final test, 9.5 each for character and willingness to perform as well as 9.25 for rideability. He converted his first start in a test for young dressage horses into a sovereign victory. His sire, Fidertanz, striking 2004' NRW Champion Stallion, is successful up to Intermediare I tests and produced hitherto 34 licensed sons. Foundation is the younger full brother of the licensed stallion and Bundeschampionat's finalist Fiderstar. Foundation originates from the Hanoverian mare line 569/Paninka, producer of 30 licensed stallions, including Isabell Werth's multiple Grand Prix winner Apache. Granddam Weniga presented the 17-time advanced level test winner Queeny, who competed successfully in the short Grand Prix with Victoria Michalke, as well as the Prix St. Georges winner Lord/Kathleen Keller.